If side exhaust is your thing, that's sweet and to each their own. Only issue I've had with side exhaust is they usually rob some horse power. 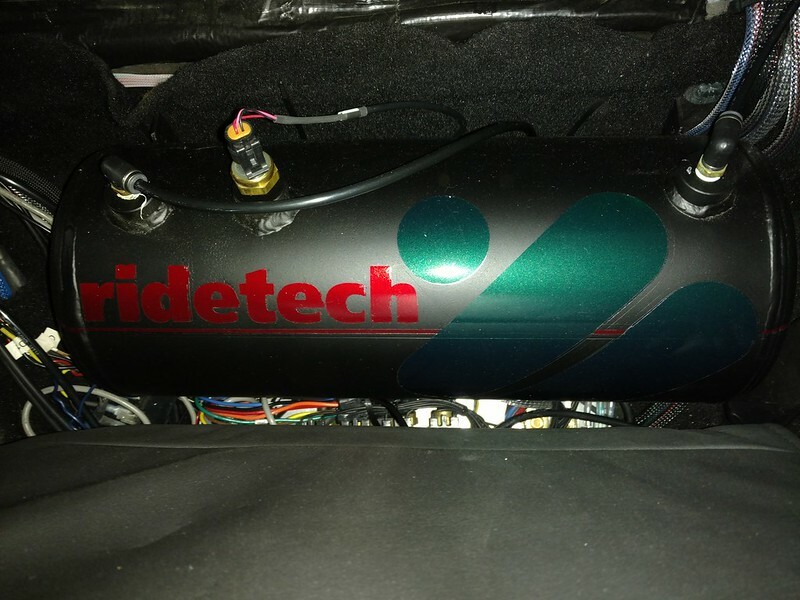 I see that you are going forced inducted which will make the side exhaust more of an issue since the higher cylinder pressures will want more air flow, thus making the side exhaust an even greater restriction. IF you have access to a dyno, I would try some straight thru muffs vs that side exhaust and it may very well surprise you. For me, I run dumped exhaust, just past the muffler. I am not out for pure performance as it still has a catted(high flow) x on it. 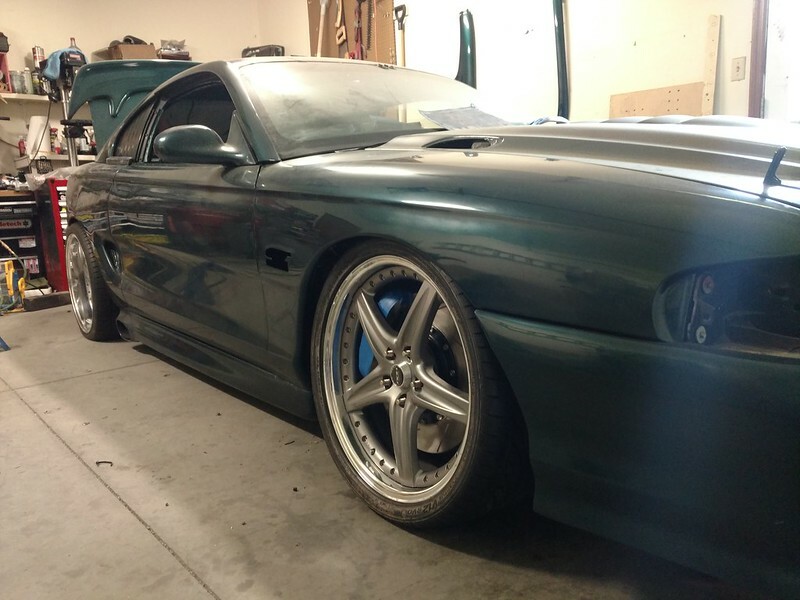 I will take it to a track but just for fun. I also have some cutouts that are installed between the entrance and exit of the muffers so it bypasses the muffler but still uses the same tip. I also have some cutouts that are installed between the entrance and exit of the muffers so it bypasses the muffler but still uses the same tip. That's what I'm talking about right there!!! gosh I can't believe how long since I updated this. Been chasing some gremlins as as well as its just been a bad winter/spring for my stomach stuff. On top of that dad just had his hip replaced and I have been taking care of him, but I have got a lot done. It started with a small fuel leak. Just a small puddle forming on the lower intake that I traced down to be the stock fuel rail. One of the few stock parts still in the car that I had no plans to replace asap since they were good to 450 hp or so but the time came. Swapping to an aftermarket rail was harder then I thought because the FPR is mounted on the stock rail but all the aftermarket kits have it external. The regulator is not that big until you need to get a hose on both sides and the bottom, and have access to the top to make adjustments. I found some space for it between the wheel well and the firewall. The other problem with the aftermarket kits was the feed line was split and then ran into the back of the rails, and there was no room for a splitter. So after some time and thought the splitter went down under the car. Running along the stock lines rout put it closer to the exhaust then I liked but running it down the side meant the side exhaust tips would be resting on the hose. 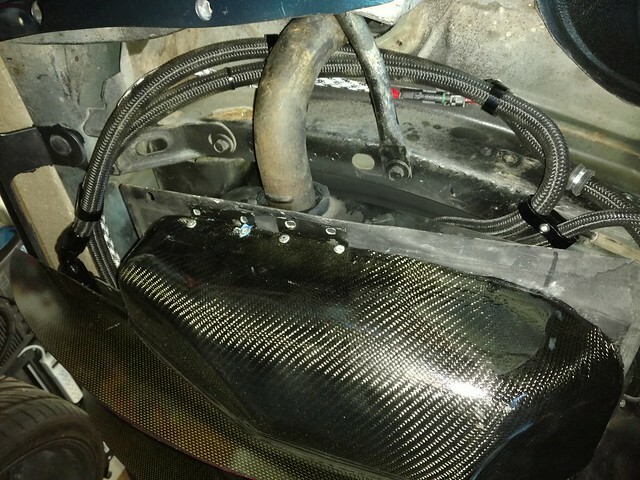 So I went the stock rout and got some heat shielding and put it on the hoses. All the stock mounts were used and I also cut some 1" strips of aluminum and covered them with marine grade clear shrink wrap. After some holes were drilled in it a rivit holds it in place to help if any of the stock mounts fail. around the tank I went with hose isolaters where I could not get mounts because I need these hoses to move when the tank drops. Holley fuel pump that should be good to 600 hp and the filters. I made this plate for it all to mount to that will go up under the bumper/diffusor. I could not help but spice up the plate a bit even though no one will see it so I painted it to match the red stripes on the diffusor. 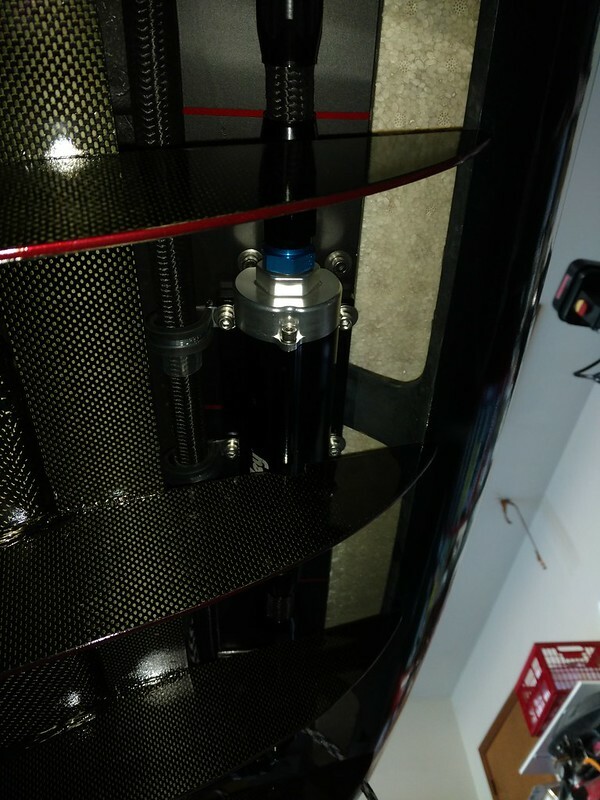 The fuel system is ready to be preasurized now and I am going to to that in the morning and check for leaks. I have also been working on some power gremlins that have had me thinking. 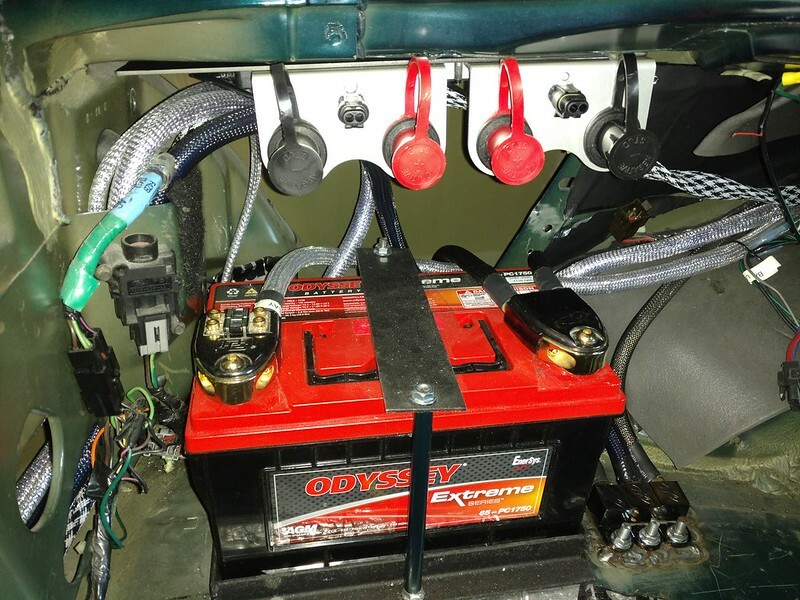 When I installed my batteries they were not next to each other so I had to balance the rules of "Keep the ground close to the battery" and "ground both batteries at the exact same place". I ended up keeping them short and because of this they were a few feet away from each other. 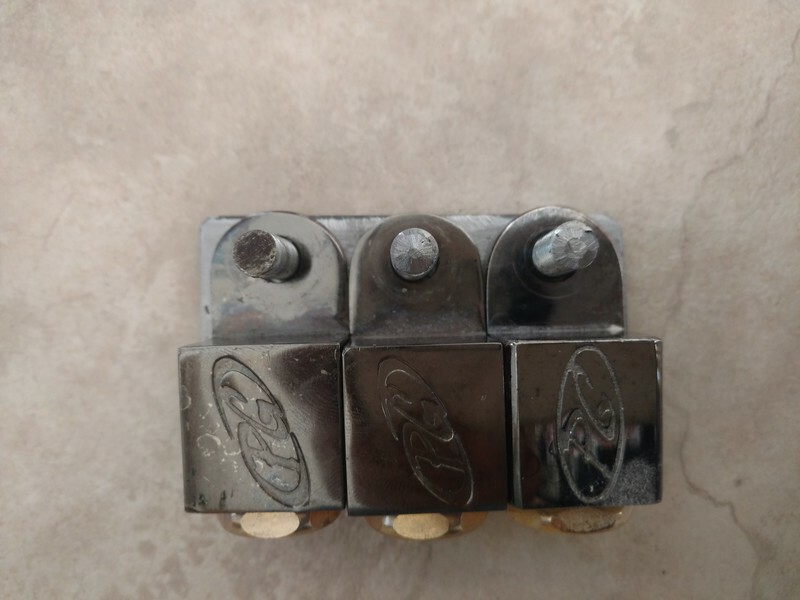 I decided to put them all together but I did not have a flat enough spot where I wanted to put it so I cut out this pieces of 1/8" steel and drilled and tapped the holes for some studs in it so the blocks have enough flat room. Then the all 4 sides of the piece was welded down next to the battery to make a flat spot that I can cover with panels later but keep easy and solid ground access. The 3rd one goes to my ground dist block for the system that is just on the other side of the back seat. I also added the remote charging lugs because the PG dude in my has always cried a little when I hooked any large charging leads to my perty perty pg terminals. I also added the 2 pin harness in the middle to allow for easy connection of my Dual pro AGM charger. Eventually I plan on moving the whole thing back 3-4 inches and have it covered yet accessible. I also added bluetooth battery monitors on the lugs. When my phone gets close it can send a notice of the batteries status's. it been down now for nearly 6 yrs. Nice to hear it fire for the first time even though it is still rough. I only ran it for a short time because the AFR was off the charts. Looking at the data now it was making the adjustments necessary to bring it down, oil pressure looks good, fuel pressure needs a slight bump and the idle down a bit but I am too busy watching the gauges to do the adjustments and my wrenching buddy is busy today. so I had it running finally but there were still some issues from what sounded like a miss to idunno what else. After looking at the engine management data my idle air control valve was staying open 100% to hold the idle at 900 rpms and as soon as it dipped even just 5% the rpms dipped drastically. I tried making some adjustments but none seemed to help and actually things got worse and suddenly it would not start at all. AFter talking to Holley about the ecu stuff they said that they do not work very well with the ford PWM IAC and recomended a $50 adapter to fit a $45 gm/chrysler IAC. At this point sure I will try anything so I ordered them. While they were on the way I took out the plugs and they were horrible so I cleaned/gapped them. While they were out I just wanted to be sure I didn't have a spark plug going to the wrong place and after measuring a few I saw that they were going to the correct place, but were also reading REALLY high. From what I read 3000 ohms per foot would be a little high, I was reading 10x that closer to 30k/foot. Not sure how or why, ordered another set of those on the way. After the new IAC and cables it did fire up but still rough. Just out of curiosity I checked the header temps on each pipe and found that #1 was not firing at all as it was still cold. Checked the new cable(again) and the plug(again) and they were good so I checked the injector output and found it had output. Thinking I had a bad injector I pulled them off and was amazed to see how dirty the tops were as well as the fuel rail. It was small black crap that to me looked like the -10, -08 fuel hose I ran. You cut it with an angle grinder and a cut off wheel, screw on the ends and then the last step is to blow it out to ensure you don't have that black crap in it. I am 99% sure I blew out my hoses but with as much crap as I got out of it I am just amazed it ran at all. Today I got it all cleaned up and put back together and fired it up. I was sooo happy to see the IAC reacting correctly and the air to fuel ratio finally down close to where it should be. The idle was too high though so I went to go adjust it down when I noticed a massive fuel leak on top of the motor. Not sure what happened as I took it all back down but in the dark with black hoses, black fittings and black orings it was too hard to tell what was really going on so hopefully in the morning with fresh light I can see better. Looking over the data from the two times it ran though it looks nice and smooth so hopefully I am down to the last couple gremlins to work out. Scott, when i made my fuel lines the last thing i did was run it though a hose cleaner. Basically i took an old fuel tank, modified the pump so that it had a -6 outlet, Filled it with 5 gallons of gas and looped each hose from the pump output through a fuel filter to the tank inlet adapter. It really cleaned the garbage out of the lines. Neon gas tanks are pretty easy to modify so it wasnt a big deal..
6 years is one heck of a project. yea it just never seems to end. That fuel leak I mentioned, here is a vid of it. Let me know if you can't see that i am not that sure on flickr. But as you can see I would think that there would be something visably wrong but after taking everything apart I was amazed to find nothing wrong. So I call summit and tell them the story and they are great about getting me a new rail kit at my door in less then 48 hours. Not knowing what was wrong I just started swapping out parts. I got everything done, charged the fuel system and checked for leaks and there was one fitting that was slightly wet, not even dripping. So I turn the key off and tighten it up a little more, turn the key back on and now its leaking worse... Tried to tighten it up again and now its spraying out again. 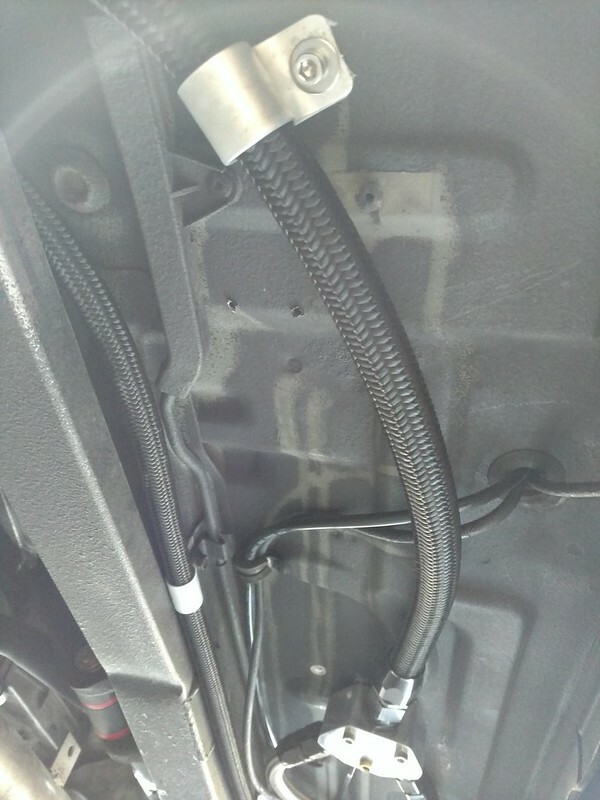 I think the steel braided hoses that came with the kit and a little too stiff and causing the 90 degree fitting that feed into the back of the rails to be stresses. I have some nylon braided hose and 2 new ends on the way to find out hopefully it will fix it. Looking at the data logs it really was running nicely for the 25 secs prior to the leak. Been working on putting the ms1000 back together and playing with the new cnc while I wait on parts. 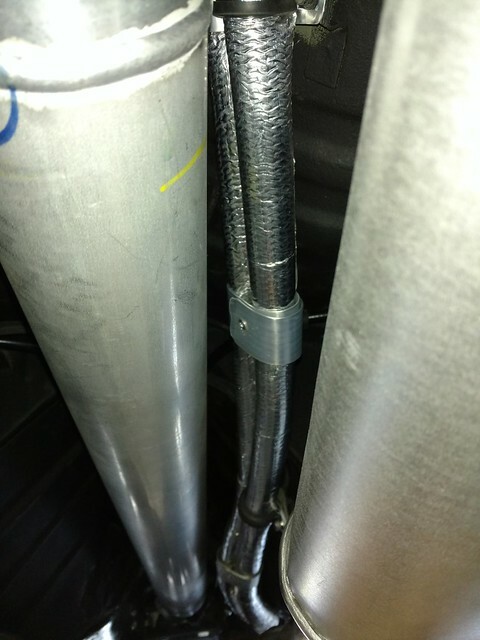 You can see that the 90 elbow is not straight on the fitting end, so like you said, theres too much strain on the cable. 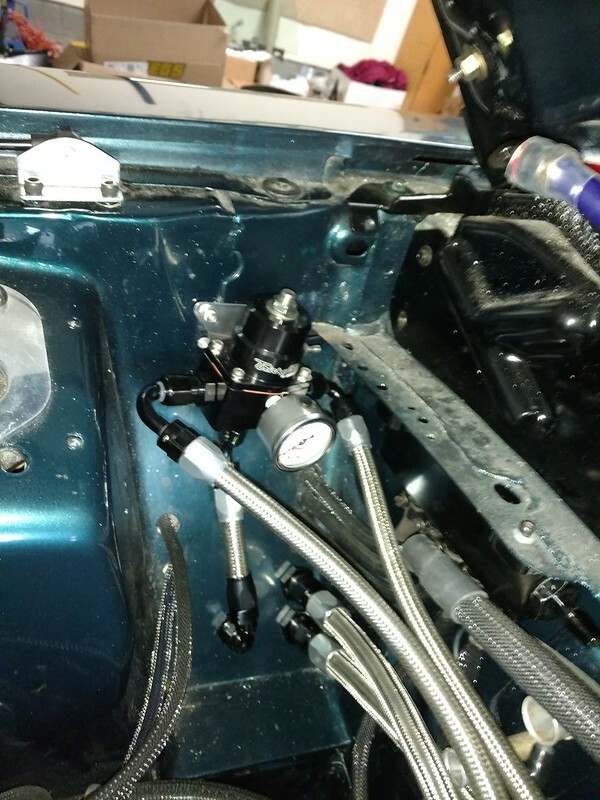 Im betting the seat and flange are not making connection inside the housing. No amount of tigtening is going to make that better. Loosen it and pull towards the inward bend of the 90 and tighten it back down. Should fix the problem, or some combination of fittings. You have alot going on in that spot. Lol. I know I took the time to get them on straight at first and it they were sealing at least at first. I kept all the hoses as short as possible and now they are almost straight lines between the Y-splitter and the 90s. The new hoses and 90s come tomorrow and I am going to leave them a little longer and see if I can have the 90's pointing up a little more then straight over and get a good long bend in the lines. The hope is once the line is pressurized hopefully it will have some give in it at the bend rather then pushing over on the 90s. looks like that was it. I got it started up and it was running nicely with a solid rpm and afr. I was busy watching all the other #s before I realized it the car was up to 190 degrees and counting, no problem still looks good. It was about then that I realized I disconnected the fan a while back when troubleshooting electrical gremlins, and I have not paid any attention to the part in the tune that manages the fan and cooling as I had just been trying to get it started. So after a quick tweek to the tune and connecting the fan now its holding steady at 215 degrees. Its a little hotter then I like since it was cool out today but it held solid there for a good while. Might have to fill the brake system and work the gremlins out of that system before its rolling. Its been a good week/weekend getting the ms1000 completed, getting the car running and I was also amazed to notice I gained 5 lbs. I have been feeling a little better after some changes and I have never been able to get above 160 lbs since I got sick but last night after weighing the 1000 I stepped on it and was surprised. I am probably one of the few men that is excited to gain any weight in my 40s but if that is the weirdest thing about me, you don't know me.. It works, did you happen to intercool the charge? Air to water perhaps? no vortechs design makes that hard to do but I already have a meth kit plumbed and wired. Its not active yet by any means but in due time. I am happy to say I have been able to keep plugging away at the list I need to finish to get it rolling/stopping. I hope the last of the parts I need arrives tomorrow and I can still take for a short drive on the 4th. Its been a busy couple of weeks but thankfully productive and with only a little cursing and pain. Your wheels are resting on the fenders, did you forget the springs? oh heck your right I completely forget every single one of them. I just had my head in other places and it never occurred to me to put them in. Lol.. I have only installed one airbag system and we took the antisway bars off the car. 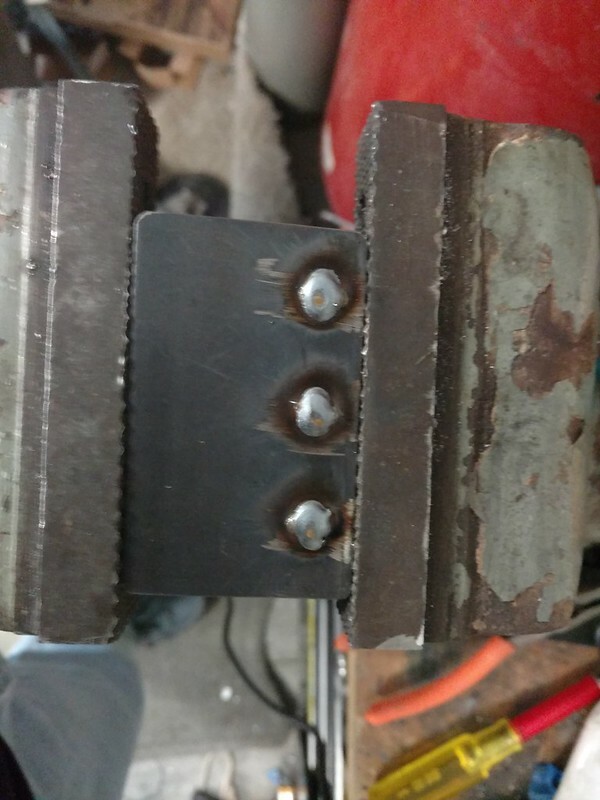 But that guy had modified the frame so it could lay rails. We put titainum drag plates for the nice white sparks they threw. Im sure you can find the right length end link to spare your tank from damage. Are you going to be doing any kind of trick stances? You could make a pwm control system for the valves so you can control the fill/dump speed. 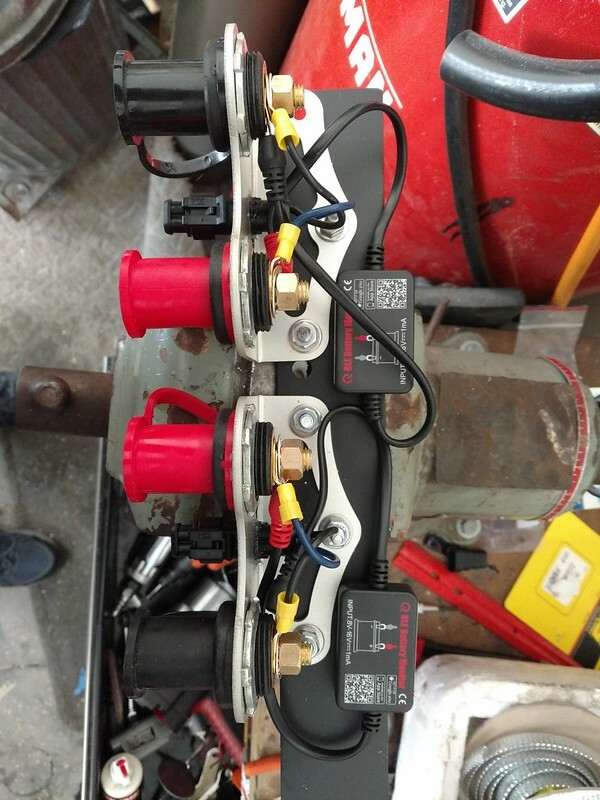 On my buddys car, we used dual speed valves with a 3/8" and 3/4" valves on each corner with a simple toggle to control the different rates from the same switch box. I never had an issue with the system while it was rolling, but for the first air these were completely aired out bags that were then just one valve switch away from 150 psi. I tapped the switch for a fraction of a second and thought something exploded. It didn't it was just tight for the first time ever. after a LOT or trail and error I finally got it all running and idling and keeping cool today. I was taking it down the driveway carefully with the new rear end gears and new hp and killed it. Then the starter was really slow and for some reason blew the main power fuse on my power wire. After replacing it now the starter clicks but it sounds like it is bound up. Gave it a few wacks with a wrench but it didn't change anything so I pushed it back into the garage and will figure it out tomorrow. I can't seem to figure out how to post vids from flickr, maybe this time? As for the idle yes stock 302s were great around 700 rpms but with the trickflow heads and stage 1 cam it liked it closer to 800 prior to the super charger addition. Today is the first time I was able to get it to idle and not over heat as I had a bad thermostat and then somehow some settings in the software were changed, or unchanged that kept he fan from turning on as well as was messing with the IAC. I hope to get it down a little lower but its not too far off and so much closer then it has been prior.